The Mediterranean Theater of Operations (MTO) saw the first operational deployment of US armoured divisions in World War II, and the experience proved chastening for the 1st Armored Division when it suffered defeat at the hands of Rommel's Afrika Korps at the battle of Kasserine Pass. This title covers the organization of these early US armored divisions, as well as the independent tank and tank destroyer battalions that accompanied them. 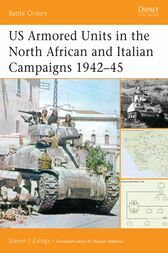 It details the evolution of US armoured warfare tactics and doctrine, learned from the difficult experiences of North Africa, and illustrates how they were used elsewhere in the Mediterranean, particularly in the Italian Peninsula. Steven J Zaloga was born in 1952, received his BA in history from Union College, and his MA from Columbia University. He has published numerous books and articles dealing with modern military technology, especially armored vehicle development. His main area of interest is the US Army in the European Theater of Operations in World War II.